Done by Forty: Did We Just Walk into a Child Labor Shop? Did We Just Walk into a Child Labor Shop? We were at the end of a too-long tour of Cairo, starting with the Giza Pyramids, then driving out of town to Memphis to see the original capital of Egypt, then off to Sakkara to see the very first pyramids on earth, that are somehow still standing after nearly five thousand years. 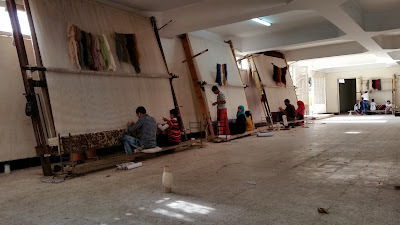 We were heading home when our guide mentioned we could go to a rug-making school, where children learn how to weave, a worthwhile skill in a place so stricken by poverty. And we could look at their handy-work and maybe buy a little something if we wanted. We were excited. A chance to see the local children bettering themselves is rare in our own country, at least for a childless couple like us, and here was an opportunity to see children building a better future for themselves in a poor part of Egypt, and to end the day on a high note. As we pulled up to the school, Mrs. Done by Forty asked an innocent enough question. "Do the parents have to pay tuition to send their children to the school?" "Oh, no. The children get paid." Immediately, we felt something bad in our stomachs. Still, we had hope. "Like a scholarship? A stipend, to help the kids while they learn?" "No, the children are paid a small fee for every rug they make. The more they make, the more they earn. So it is a good system." It was too late to turn back now, so we entered the ground floor of the building, with a single, large room taking up the entire floor, with looms all around, and a child at every one, dutifully working away. There were a couple adults working as well: we were later told these were the artists who handled the more complex designs. Some of the fathers working had their children working alongside them, the guide told us. Everyone seemed to be focused and intent on their work. But when we entered, every eye turned to us, the weird foreign tourists who came to see how rugs are made. 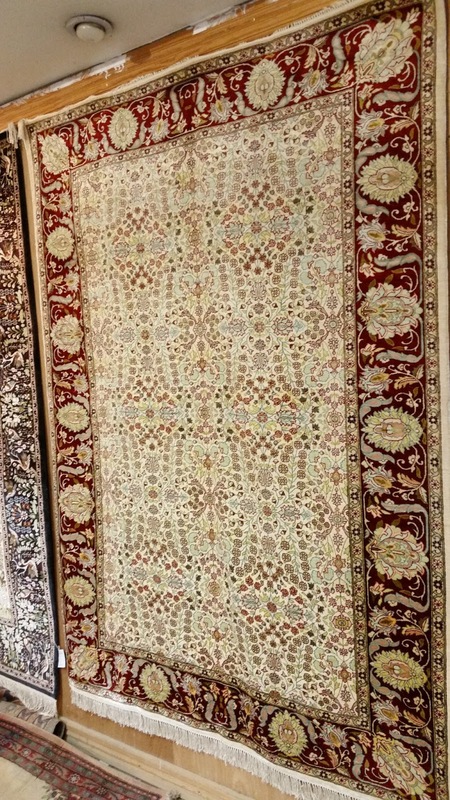 The owner, or manager, whoever, the guy in charge, came up and introduced himself in perfect English and offered to show us around the place, to see how the rugs were made. First he took us to a silk loom where a girl, maybe twelve years old, was making a beautiful blue and yellow rug out of tiny, smooth strands of silk, tied deftly with a knot in her little hands, and then cut with a tool. Over and over again, with hundreds of knots in a single square inch. Here she is, in the picture below. 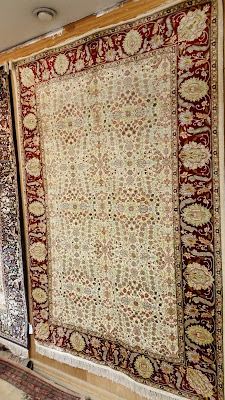 And after weeks of work, here is what the finished product looks like, with hundreds or thousands of these rugs available for purchase in the show room right above the workshop. The silk ones are unbelievably smooth to the touch - as beautiful as they are they beg to be walked on in bare feet. As I am no reporter, I failed to ask any of the important questions that would have given us a better idea of how this place really operated. I didn't ask how much the children were paid, though as the large silk rugs sold from eight thousand US dollars and up, part of me hopes they are making a very good wage, and part of me knows that is hopelessly naive. I didn't ask how many hours the children worked, though our guide mentioned the kids came after school and worked during the summers. So I should give a clear disclaimer: I really don't know if this place qualifies as a child labor shop. There were children making rugs, and they were apparently making money. But the room was fairly well lit and well ventilated. The kids honestly seemed happy as some smiled and waved to us walking by. Maybe this is just a school with a pragmatic mission: to teach young people a trade. Maybe they are doing a great service for their community. I just don't know. At the time, it sure felt like the business was making money by having children do the work, at least to this one ignorant American tourist. The more interesting part was the way Mrs. Done by Forty and I debated the issue afterwards, on our drive back to downtown Cairo. Even if it were child labor we just saw, we were conflicted as to how we ought to feel about it. We saw a lot of poverty in Cairo, with children asking us for money or food on our way out of a grocery store. Our tuk-tuk driver couldn't have been older than fourteen. We saw children loading vegetables onto carts, to be pulled by horses in the Cairo streets alongside taxis and cars. So, it seems that children are involved in the earning of money here. If that's the reality, was this rug school/shop such a bad option for them? It's pretty easy for me to just say child labor is wrong, end of story. Which sure, yes, it clearly is. But when your family is poor, working for money is a good alternative to going without food, too. In a world of bad options, you choose the best one available. I remember my mom telling me a story when I was a kid and I was complaining about some little American problem I had. She told me that when she was going to school, she only had one uniform to wear, so she had to hand wash it every couple days herself to keep it looking presentable. But the sad part was that she had to wash other kids' uniforms, too, those of families that were better off, to earn some money for the family. And she didn't get to keep any of the coins the families gave her, either: those went to my grandma, to help with the family finances, which were pretty dire considering they were all living in a one room house with a dirt floor. So I should stop complaining about being grounded and not getting to watch TGIF. Given my mom's upbringing, I might have a weird view of child labor in general. It's definitely a bad thing, one the world would clearly be better without. But these poor kids in Egypt probably have to work in some capacity. Either in the fields that we drove by, or in the cities of Cairo in some capacity. 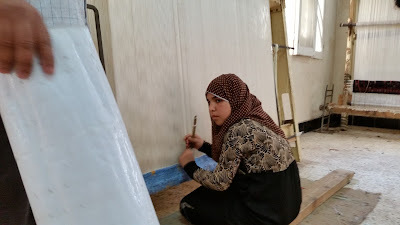 Maybe learning a marketable skill in a well-shaded, cool room that is outside of the Cairo heat is not as bad as it seems to a couple well-to do tourists from the states. Maybe the situation is complicated. Anyway, enough of that grandstanding for now. I promise a more enjoyable post the next time I am by a computer: maybe one with some pictures of African wildlife and an explanation of how we were able to do this trip on the cheap with help from Brad at Richmond Savers. But either way, I promise to avoid depressing topics for the duration of the trip. Nothing like travel to help you think about things that we normally take for granted. Sounds like a good trip! Exactly! My favorite part of travel is the epiphany of how flipping fortunate I am, and how every day is a preposterous blessing. I think you are right to question such a black and white opinion as all child labour is bad, period. I had a job from the age of 10 delivering about 100 very heavy papers and was paid practically nothing for it. Of course the line needs to be drawn somewhere and hour and wages need to be regulated and blatant exploration banned. It is very hard to tell exactly what was happening at the place you visited but I can see why you had concerns! Unfortunately I'm guessing none of us will ever know. Again you hit the nail on the head surely it's better to be exploited and make SOME cash than be on the street begging. I hope the rest of your trip is a little less morally hazardous :"
Agreed. It is more complicated than I would like to admit. Ought we simply boycott any shop like this? Of so, would the kids just work in worse jobs? There definitely needs to be a line. I am just not the man to draw it. Wow, I don't know how I would feel about it either. On one hand, it makes me sad to imagine children slaving away for low wages. Still, learning a trade like this might help them throughout their entire lives. I'm sure the local economy and culture could provide context, but it sounds like this might be the norm there. I hear you, Holly. I regret not asking more pointed questions and trying to really understand. Instead, I just acted the part of the polite American and went on the tour. I agree with you here, DB40. Having grown up dirt poor (there were days with NO food in the house and no electricity in the dead of winter) I would have welcomed the opportunity to earn more, even as a child, in order to help our family survive. I didn't officially start working until I was 14, and I was certainly paid fair pay for the times, but it was such a relief knowing that the income that I earned help make it so things weren't so horrible financially at home. My mom never asked me for money, but I knew that giving her some was the right thing to do. We were a family. A team. And while I would imagine the working conditions in Cairo were much worse than what I dealt with, I also would imagine that these kids gain some of the same gratitude that I had for being able to help their families have a better life. That's a fantastic perspective, Laurie. It sounds like you and my mom had similar circumstances, half a world a way. And I love the comparison of a family to a team. I certainly believe that we have an unprecedented privilege to allow children to develop without needing to be economically responsible, and it's a privilege that in my opinion ends up hurting kids because they never learn anything about work or adding value (or about personal finance beyond being a consumer). So, was the child labor you saw bad? Was it some form of child abuse? I would say that you should not put your own kid into similar circumstances, but if a kid in Cairo learns a trade early on, it might be valuable for them. It's really tough to say because our economic needs are intertwined with our views on parenting. Great perspective, Hannah. We're in a time where almost everything we experience is fairly recent, historically. No, the labor we saw was not bad, at least from the few minutes we saw of it. I'm not sure how long the kids were at the looms or what they were paid, which might change my view of it...but the space wasn't cramped, it was cool and comfortable in the room. I simply love the dialogue and perspective the experience stirred up for you and Mrs. DB40. That's the greatest benefit of travel, in my limited perspective. It's getting out of our American bubble and experiencing the gray areas of life that we too often compartmentalize into easy-to-handle good/bad boxes. These experiences lead to thoughtfulness and wisdom. Can't wait to get out of the country more myself! Thanks for the kind comment, Emily. I love the fact that we can get a good discussion going on my weird little blog. International travel is a pretty new thing for me, starting with our honeymoon in 2011. But I have the bug bad now, and agree the best part is seeing how people live in different ways than my suburban American life. I too applaud you for not jumping to a moral position. In poorer countries the lack of technology and mechanization means that every pair of hands must work to provide a higher standard of living. When those hands can create an item that can be outsourced for high prices it effectively removes money from OUR economy and increases the money in THEIR economy. My mother used to rant about child labor used in make cheap shoes. When I pointed out to her that the wages paid to the children in the factories for just a few hours were greater than the families would earn in weeks, regardless of how low the amount may seem to ourselves, she refused to listen. When the reality that the difference between a child working or not working is not a choice between poverty and wealth, but of levels of poverty was brought up she was sure of her moral stance. When the secondary choice, which was not that Nike would begin paying USA wages to teenagers in third world countries but that Nike shut down the manufacturing plants and take the jobs elsewhere... well. The lives of many of us are hard. Very few are ideal. Very well put, Morgan. Often workers have to choose between suboptimal options, though working for a wage, or having your children do so, might clearly be the best one to go with. I like your macroeconomic angle, too: we often just buy from where the cheap (child) labor is, regardless of whether we are aware of it. I was thinking of using an anti-local angle for this piece, as you noted that it is good to take money from our economy and put it into theirs. But this example, child labor, might be the countér point. There seems to be a reflection here of the middle ages, with young workers acquiring a trade early on as opposed to our current system of early education. I'm not sure what I think about the whole situation. With many of us unemployed or underemployed, heavily in debt, etc it's hard to hold up our system and suggest they should be more like us in either our morals or our society. It's a very different path they are on. Great point about middle age type of trade school. Though I think we are undeniably better off in our system than theirs. Kids are driven to college rather than a trade here...in the aggregate, that is a better approach. While my automatic reaction, not necessarily driven by being a mother either, is "child labor is bad!" I know it's not that black or white. Most importantly: Are their working hours also compatible with allowing them to get an education? If they're working on the side and earning some income while still getting their education, I can understand that being better for them than not. If they're only working for a pittance and not getting an education outside of that trade, that would be much more problematic. I say this as someone who worked from the age of 9 (for my parents) and age 15 for a wage - I was very happy to contribute my labor for the good of the family and to fund my own pursuits but it would not have been good for me in the long run if all I did was work and not go to school. I really wish I had asked those questions. Our guide said the kids still went to school and, from our brief look, the kids seemed to be working in good conditions and in good spirits. That kind of stuff puts things into perspective doesn't it? I somehow wish American kids can all see certain levels of poverty in other places firsthand. I think their perspective on life might change a great deal...at least for a little while. Somehow we always return to our baseline thoughts. That really is the pattern, isn't it? I wonder is the baseine changes somewhat? That is really crazy about the child labor but i cant say im surprised one bit. I bet there are places like that all over the world. Its crazy!! Will definitely post a trip summary with photoa, and a lot of them are already up on our Instagram feed. Agreed that children working is probaby the norm the world over. Maybe I shouldn't be surprised. Reading this post makes me feel very privileged. And I guess that's a good thing, 'cause we all need to have a healthy dose of perspective every now and then. We felt the same way when we went the Cuba. Saw lots of shanty towns with kids running round in garbage dumps, and some selling crafts by the beach. I wasn't prepared and all I had on me was a pencil and can of coke, but they were SO grateful when I gave it to them. Really made us realize how lucky we are and want to help. Thank you for this post. Very eye-opening and helps you appreciate what you have. I'm guessing the situation's quite a bit more dire in Cuba than what we saw in Cairo, but who knows. Would love to visit someday. Thanks for the kind words, and glad we found your blog! Not true that you can't travel with children. We do! it is different of course, but still awesome! We have been to France, Germany, Czech Republic, Switzerland, Luxemburg, Norway, Portugal, Bahamas, Dominican Republic (different trips) when our son was between 2-4yr. And to Portugal and France with our 4yr old AND 7 month old! We do not plan to stop. We could be FI sooner, but travelling is our luxury. That's great to hear, Margot! We may travel with our kids, too...just have to feel it out at the time. Our dogs are probably a harder thing to work around. Hard to get people to watch them for 3 weeks+.